Now Shipping Worldwide: "Cinema Retro's Movie Classics- WWII Movies Of The Sixties"! In 1940, the British Royal Air Force fights a desperate battle to prevent the Luftwaffe from gaining air superiority over the English Channel as a prelude to a possible Axis invasion of the U.K. This movie's opening prologue states: ITALY, AUGUST 1943. Costanzo: [to Gabriella, obviously the mistress of the Nazi Von Klemment] Um... uh... What on Earth are you doing here, my child? Maj. Eric Fincham: [amazed at his naiivety] Oh, Padre, you are priceless! Q: On which railway line were the action scenes at the end of the movie shot? *** Warning ***: I make a few references to this film's plot in the comments below. I think if I was living during 1943 and was involved in World War II then being with Frank, Trevor and the rest of the boys as portrayed in this film is where I'd want to be. Racing up Italy in a captured POW train, honorable American and British soldiers fighting pesky Nazis, and just trying to make it to beautiful Switzerland. Who could ask for more? You have adventure, killing in self-defense (well mostly), outsmarting the enemy, and a gorgeous young Italian woman on the train with you! Sure beats being a German soldier stuck in Stalingrad in 1942! And let's face it, if you're looking for a WW II film with historical accuracy about specific WWII events or a "war is heck, here's why" kind of film then this is not the kind of film you're going to like. But to me this film offers something many others don't by how it relates to everyday life and its struggles. So what am I saying, escaping from a German POW camp and fighting Nazis is a daily life struggle for anyone nowadays ?? No, of course not. But I like the way misfortune then opportunity seem to go hand in hand in this movie. A misfortune is turned into another opportunity simply by trying or moving forward. The following two lines best sum up this film: Captured German Major: "But still you have NO choice!" British Major: "And nothing to lose by trying to make one!" Nothing is mapped out they way they want it and each misfortune has its cost in lives lost, but they push on. Each loss looks like it is rewarded with something positive... British physician (who up 'till now has been supportive of Colonel Ryan): "Roll, roll where?...Maybe this is the end of the line". Italian Captain (just running in): "Colonel Ryan, the conductor has a plan, he thinks he can get us all to Switzerland!" British Major: "Switzerland?...You're mad!" (The Italian major explains the conductor's plan) British Major: "You know it may just work" Colonel Ryan: "Let's move!" Sometimes we are all fighting those "Nazis/demons" in our life and we are all just trying to escape to "Switzerland" and like the end of the film says: "I once told you Ryan, if only one gets out it's a victory". I read in another review of this film where it was said Frank Sinatra looked like he was sleep walking through it -- well then way to go Frank! No award grabbing performance from "ol' blue eyes" here, just a man who acts and feels like he's just been in a POW camp (the Rat Pack must've just broken up or a gig in Vegas got canceled or something). I think this is one of Frank S.'s best movies, yes much better than that depressing "Manchurian Candidate" (1962). And give this film credit for one thing: Here at least the Germans speak German and the Italians speak Italian. There's none of that English with a heavy German or Italian accent stuff here. And filming outside when possible with picturesque Italian and Switzerland scenery are an added bonus. 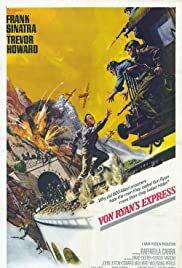 I know there are several other WWII films made during the 1960s that get mentioned a lot, but off-hand I think there are only two or three made during the '60s that offer or have any value: "The Train" (1965) and "Closely Observed Trains" (1966) are the only two I can think of (hmmm...that's odd, but all three involve trains). If you liked "Von Ryan's Express" then please recommend other war films from any decade. I'm always on the look out for a good war film. And if you didn't care for this film, well then when you're through picking this one apart tell me of one you did like. Thanks.